50 Pesos Gold Coin Value – How To Measure It? 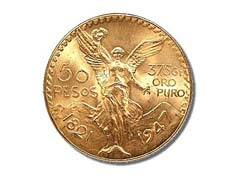 50 pesos gold coin is also know to gold consumers under an alternative name, namely, Mexican Centenario. 50 pesos gold coin value is hard to beat due to its lower premium charges and heavier gold weight compared to other popular gold bullion coins like, American Eagle of Canadian Maple Leaf. Gold pesos can be an ideal choice for many investors, and this is true of almost all of the gold Mexican coins. Unlike the American Eagle coin, pesos usually have lower markups and cost less to purchase, so your investment capital can go farther with these coins. Initially minted in 1921 to mark the anniversary of Mexico’s Independence from Spain, 50 pesos coins are limited quantity bullion 20% larger than their standard one ounce bullion counterparts containing 37.5 grams of pure gold . Gold Mexican Coins – Are They Worth Investing In? Are gold Mexican coins worth investing money in? The answer is a big yes for most investors, because of all the benefits that these gold bullion coins offer. There is a large variety and plenty of choice with these options, and often the price you pay will be less than an equivalent weight in the form of American Eagle gold coins, because the dealer mark ups and charges are significantly lower. One of the most beautiful bullion coins in the world, Mexican pesos are manufactured from 90% gold to 10% copper alloy giving them superior scratch resistance and ability to preserve its original condition for longer. Historically low premiums for these coins are an added bonus for all investors seeking to purchase them. 1. Mexican gold pesos are not as popular as many other gold bullions minted in the US, Canada, China or Australia, but these can be a fantastic investment choice. Gold had been an important metal through Mexican history, dating back to Aztec civilizations, and that trend continues even today with coins that are struck at one of the oldest mints in South and North Americas. 2. Mexican gold pesos were not the first coins to be struck of gold. 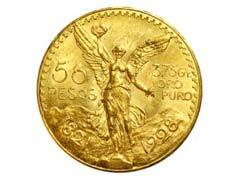 The very first Mexican gold bullion coins were called escudos, and included a variety of denominations. They were used until the mid eighteen hundreds, when they were replaced with the more modern bullion appeared instead. 3. The 50 pesos gold coin was created specifically to mark the anniversary of Mexico being independent of Spanish rule for a century. This coin is the most popular out of all the coins available from Mexico, although the Mexican Libertads also have followers of their own with certain investors. 4. Mexican gold pesos were only minted in the fifty peso version for a limited number of years. 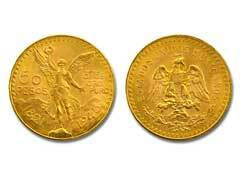 The minting of these specific gold pesos coins was started in the year 1821, and their production was stopped in 1947. This limited run also makes these coins a good investment choice for many, because the supply is lower than the demand. 5. It is possible to find Mexican gold pesos that range from one peso all the way up to one thousand pesos. The one thousand peso coin will weigh one ounce of gold, and lower denominations will have a fractional weight with the current coins. This is not always true with older coins though. 6. Some gold Mexican coins can be hundreds of years old, and these coins have a higher numismatic value than they do a value in gold. Some escudos can date back to the seventeenth century, and were hammered by hand during their creation. 7. For most investors, the modern Mexican pesos are the best deal. These coins can be found at low premiums, but the quality and quantity of the gold is known. These coins are considered attractive and appealing for collectors as well as investors.